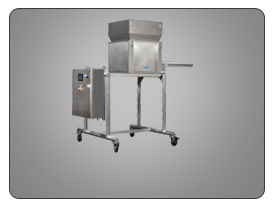 Our complete line of vacuum conveyors ranges from small portable units for minor ingredient unloading or material transfer to large units capable of moving up to 18,000 lb/hr of material. 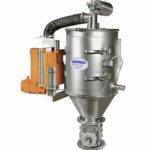 Large vacuum conveyors are suitable for transport in bulk bag unloading, dosing, and batch feeding of process tanks, mixers, and other process equipment. 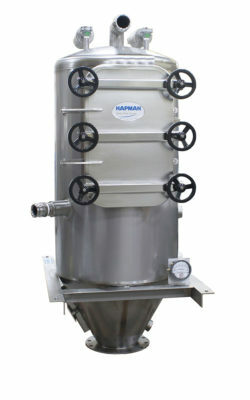 The Hapman Vacuum conveyors can be provided to meet the standards of the FDA. With the standard side-door entry, and tool-less filter removal, the Hapman Vacuum Conveyors are designed for ease of cleaning. With few moving parts and easy access to all standard maintenance components, the Hapman Vacuum Conveyor will provide years of easy care performance. The X-line Vacuum conveyor is designed for the applications that must give special care to explosive environments. 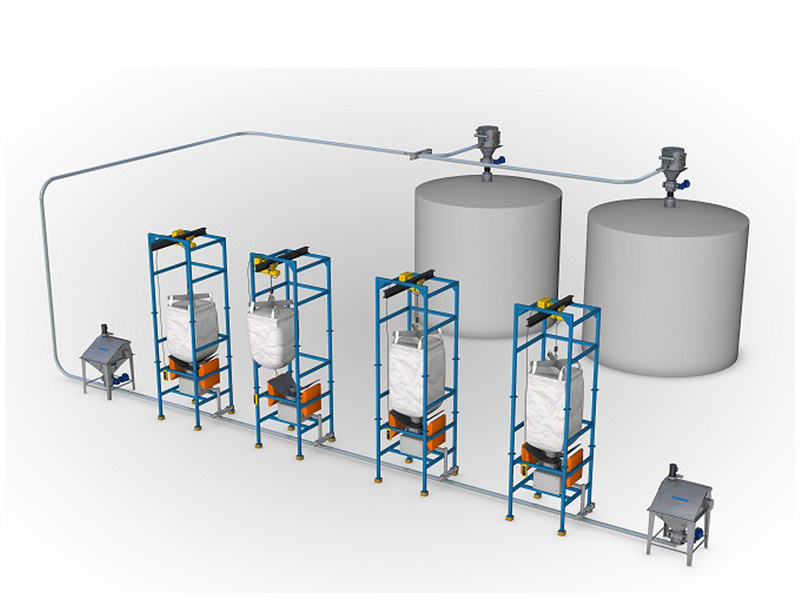 The basic principle of pneumatic conveying is to move suspended bulk material in a relatively uniform stream from a feed or supply source to a delivery point. The application of air, supplied via a vacuum pump or blower, creates a high enough air velocity and low enough solids-to-air ratio to effectively move the materials. What Makes Hapman Vacuum Conveyors Different? Our vacuum conveyors are engineered with unique features designed to make them easy to use, install, and maintain. Using the exclusive side-panel door you can easily access the filter(s) for inspection or changeout. 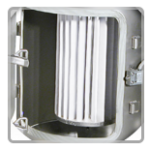 The threaded T-handle allows the filter(s) to be removed without the use of the tools, decreasing the time required to perform routine maintenance. The side access door also allows for installation and pneumatic conveying in tight spaces, even near the ceiling. The single switch operation of our vacuum conveyors starts the low-energy consumption regenerative blower or PD pump for larger units. 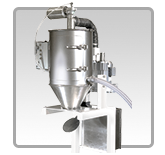 Our pneumatic conveying systems use air flow only as a means of creating the vacuum. 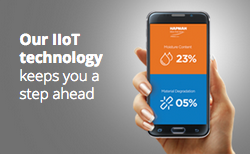 No plant air is required for conveying, making our vacuum conveyors more energy efficient. The engineered design of our vacuum conveyors offers greater operational efficiency and energy savings while also providing increased capacity and less volatility of flow. Our regenerative blower works off a vortex air flow principle. This means that air is effectively moved between vanes as a single-stage impeller rotates. 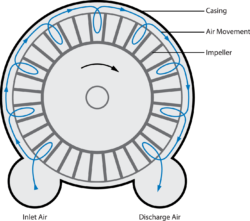 The spinning impeller and air flow create the vortex flow pattern, while the single-stage impeller design creates the velocity energy to be regenerated many times as the air flows through the casing from inlet to discharge. This pattern of air flow offers significant advantages over traditional impeller designs. Higher Efficiency/Lower Noise Levels – The traditional double-sided impellers create an air flow patter with twin vortices. As the two vortices intersect at the blower discharge the volatility creates significant noise. Our lower DBA unit means less added noise in your facility. Lower Ambient Operating Temperatures – The single-stage impeller design generates less heat during normal pneumatic conveying operation than a traditional double-sided impeller. This means longer life for the motor and less heat dissipating into your facility. 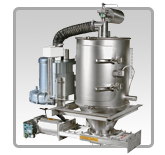 Our vacuum conveyors come with various value options. We will select the best discharge valve for your application. 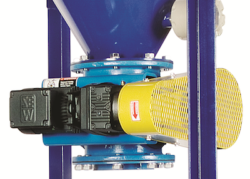 What makes our pneumatic conveying units unique is our rotary valve design. Many vacuum conveyors operate using an intermittent design, where the chamber is filled with material and then a trip point is reached to activate the discharge valve. Once the material is discharged, the valve closes again. This causes some carryover material to stay in the line until the next cycle, when air pressure moves product to the final destination. For most applications, we don’t see this type of operation as effective. Our vacuum conveyors with the rotary valve option provide an even, continuous flow for greater capacities in smaller-sized units. This means lower initial equipment cost and lower operating costs when compared to intermittent pneumatic conveying systems. The risk of explosion continues to be an operational concern for just about every processing company. 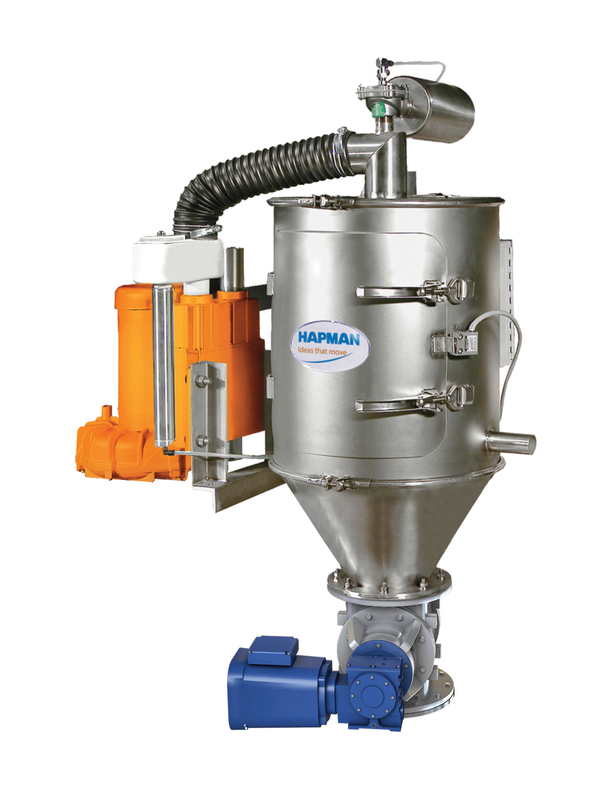 To address this issue, Hapman has introduced our NEW E-Line of vacuum conveyors designed to be fitted with either explosion venting or an explosion suppression system. In order for an explosion diffusing system to function properly in a vacuum system, the conveyor canister must be able to contain a certain level of pressure before the system activates. Our new E-line of conveyors provides this level of protection while still offering the features which have made this vacuum conveyor the standard bearer in the industry. 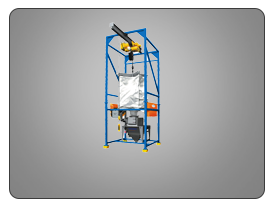 A side-access door for filter removal and reverse pulse filter cleaning come as standard features – all while containing the required pressure. Vacuum conveyor with slide gate valve option. Vacuum conveyor with dump gate valve option. Rotary valve design for continuous material flow. Note: Specifications subject to change without notice. Contact a factory sales engineer for specifications and options. *Nominal capacity based upon 50 ft. (15,24 m) equivalent length piping. **Larger blower sizes and configurations available. Our vacuum conveyors with unique side-panel access offer virtually unlimited installation possibilities. The side-access door allows for easy filter maintenance and no interference with the side-mounted blower or pump. 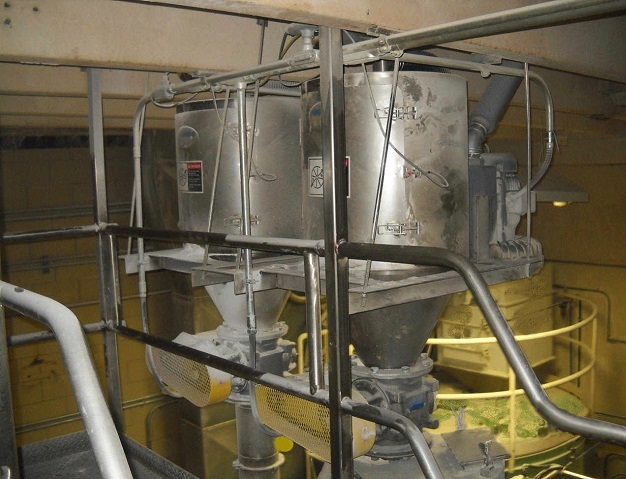 This pneumatic conveying system is engineered for the batch processing of major and minor ingredients to create a blended mixture for further processing downstream. The engineered bulk material handling system uses vacuum conveyors to effectively pull materials from each unload point and deliver a mixed-materials batch into one of two storage silos. A complete controls package continually monitors the delivery of each material to produce the required feed rate. The batch controls allow operators to adjust the mixture and ratios on demand, giving processors the ability to create thousands of recipe variations within the framework of a single system. 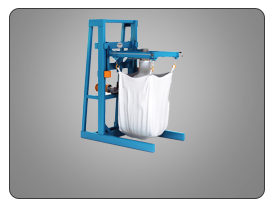 Bulk Bag Unloaders – Each is equipped with a 2-ton electric hoist and pneumatic bag agitation for efficient material flow. The unloaders have load cells for the accurate, real-time measurement of material flowing out of the FIBCs (loss-in-weight). Each bulk bag unloader also contains a bag tie box for full-flow shut-off prior to full bag emptying. 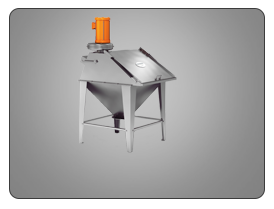 Bag Dump Stations – Each of the minor ingredient stations have a manual bag dump with integral dust control to 1 micron. The discharge has an actuated diverting valve that is opened and closed automatically at the required ratio to meet the recipe material call. 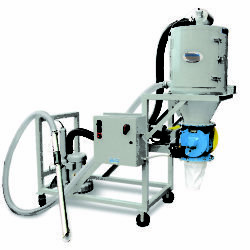 The vacuum system is sized to handle the maximum required flow rate of the blended product. An actuated diverting valve allows for controlled filling of the holding tanks. 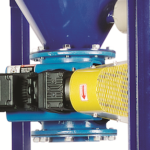 The integral regenerative blower on each conveyor generates the vacuum that effectively pulls material through the piping and into the tanks. No expensive plant air is required to operate the conveyors. The self-pulsing system keeps the filters clean. When maintenance is required, the tool-less side access door allows for quick and easy change of the filters. The storage tanks have level controls that open or close the discharge valves on the conveyors. The controls allow for minimum and maximum levels to continually and automatically be maintained inside the tank.